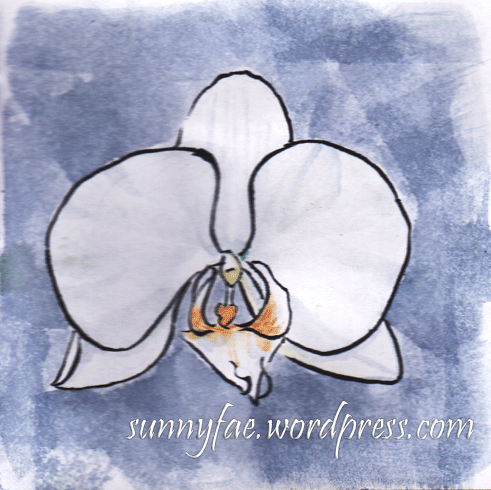 This week I have been drawing orchids, lots of orchids. 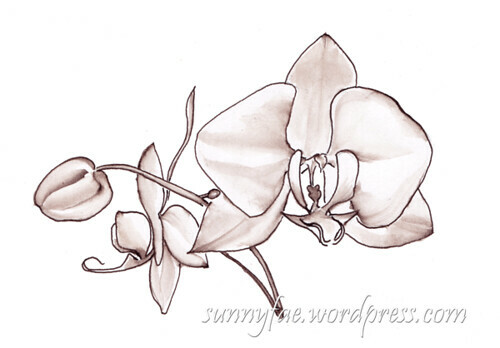 We have two orchid plants in our house, mine is the pink striped one and the other is white with slightly bigger flowers belonging to my daughter. We are extremely happy with ourselves because amazingly they are still alive after over a year, whoot! 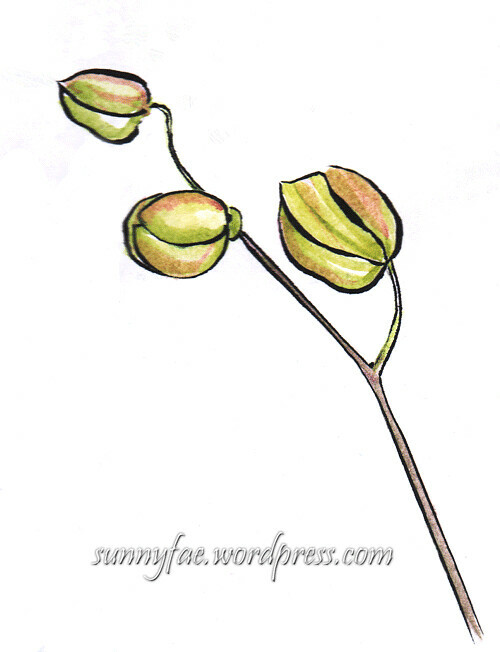 The pink one started to flower last week and I drew one or two sketches of it. This week the white orchid is flowering, it has grown four flower spikes so far so there will be lots of drawing opportunities available in the future. 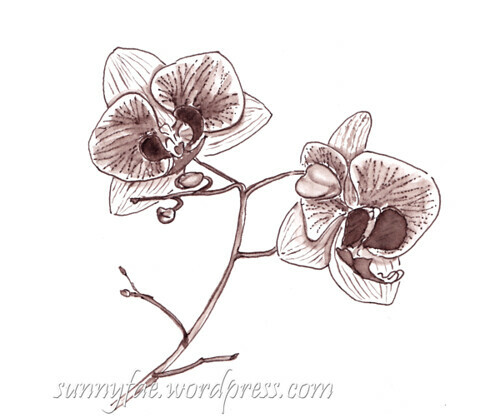 A drawing of a white orchid in brown ink. I love the colour of this ink. The next two are drawn the way I usually draw things in general, with a pentel brush pen. I know it makes them look a bit cartoon-y but I like the effect. I also wanted to use these drawings as a pattern for watercolour and thought it would show better though the light box and paper. It did. The shadows didn’t show up too well on the scan of the flowers, to be honest I’m not sure they were strong enough to start with, something for me to experiment with later. 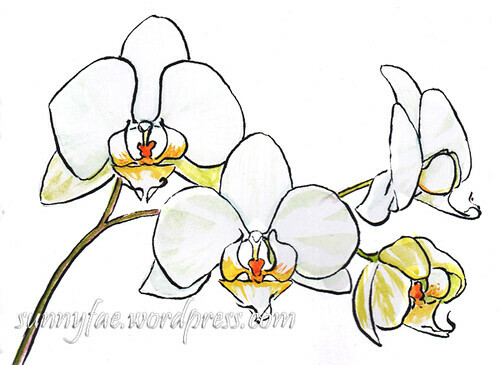 A sketch of a white orchid spray. 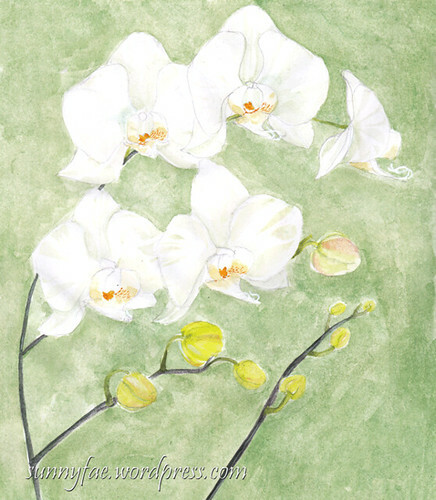 I painted a green background on this one trying to push the white flowers forward, I had wanted to try to paint it without the heavy lines but the shadows again were not strong enough. This is all useful information to take into future drawings. 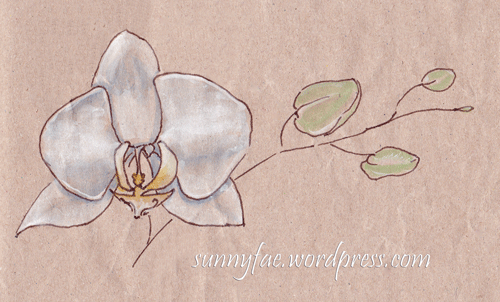 This one was more an experiment with the paper than the drawing. I like the effect of the blue background and I will try this again. The paint was applied with a 1” synthetic brush in a criss-cross pattern. All of these drawings were done in my sketch book which contains a coated cartridge paper so an even wash is not possible. It turned out quite well and isn’t any where near as much work as the green background in the image above. Finally watercolour paper (phew!) This is always fascinating to me, the water was added and the paint allowed to travel out along the water. I like the colour and the way this turned out, again the shadows are not strong enough. I could have fixed it maybe but the next day it had been made into a birthday card and was winging its way to its new home. Its recipient said she liked it and that’s what really matters. I love playing and working in my sketchbook, It’s nice to make pretty pictures but my sketchbook is the place I experiment, make mistakes, learn from the things that worked as well as the things that didn’t. If all my drawings were perfect there would be no need to practice and for me that is where the fun lies. 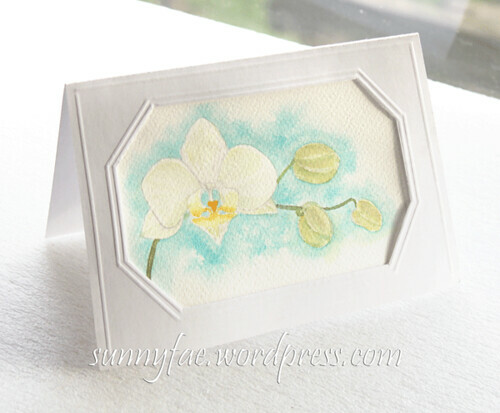 Nice orchids, I really like the “White Orchid Spray” one.